Ran the TMT Sunday morning in a group of six runners. 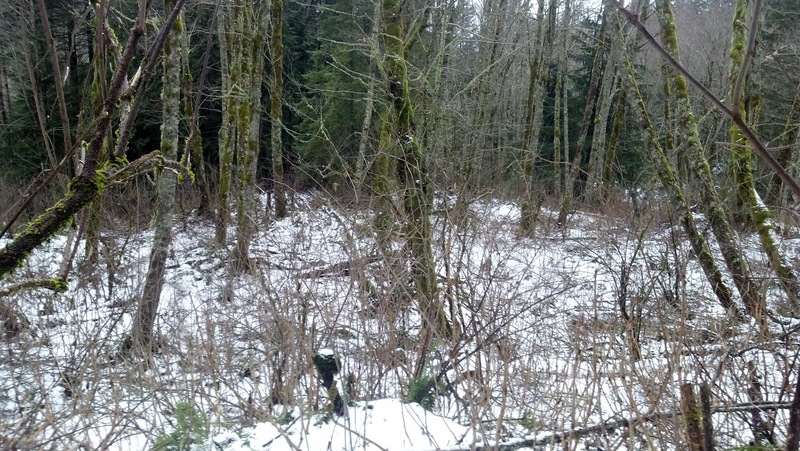 The TMT (Tiger Mountain Trail) starts at the Tradition trailhead, snakes around West Tiger to the east, up & over the saddle between Tiger West 1 and Tiger West 2 and then winds its way south toward and around Middle Tiger. It's a beautiful, plush, single-track trail with far less traffic than the other Tradition trails seem to have. There is also a lot of opportunity for side trips as you cross a lot of other trails. The shame is last week was my first trek onto the TMT and it was just to get us to some other trails. Today we spent our time "out" exclusively on the trail. Even better I had a pretty good idea where I was since I'd looked at the map in between visits. 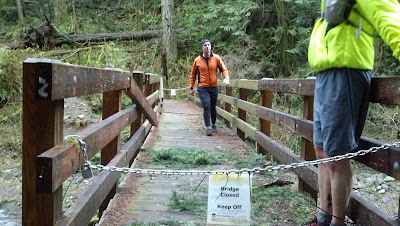 We did run into a bridge that is "closed" although I think it's been like that awhile and we just hung to the side to cross. Trails were a little muddy to this point given the recent storms but not too bad. 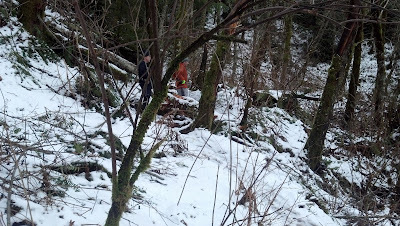 We hit snow about 1700-1800' and saw a fair amount of blowdown along the trail (especially on the east side) due to a wind storm the night before. We lost two runners by this point so it was just four of us for the remaining run (the other two found their way out fine). Of course once you hit the snow you have to play. We were on pretty good trails and had some nice ups & downs to push through. Above you'll see Ben taking off and me trying not to crash into a tree while holding my camera phone (note the video isn't all that great). We ran all the way to Dieter Springs which is a fresh water spring between West and Middle Tiger and those that needed to refueled. On the way back we ran into a Barkley finisher and chatted him up a minute or two - he was headed all the way down to Middle Tiger. We got back to the W2 / W3 saddle and humped up to W3 and back down to the trailhead via T3 (well, I did. Ben & Aaron took off down Cable Line). T3 is the most popular route on the mountain providing direct access to the peak of W3 and there were plenty of hikers out today. It also unfortunately has a boatload of embedded rocks which makes running down most unpleasant. 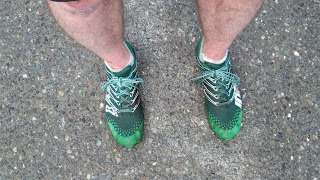 This was my first run in new shoes - the Inov-8 F-Lite 233 which is billed as a "fitness" shoe as I think the line has a lot of loyalty in the CrossFit market (from what I hear - don't quote me). Regardless the F-Lite 195 is my go to road runner but I wanted something with a bit more cushion for Badger Mountain so I thought I'd give this a go (I have not been happy so far with the Montrail Rogue Racers). The fit is great and they handled well with a non-lugged tread even in the snow and mud although I was certainly not pushing the issue in several spots that I otherwise would have. 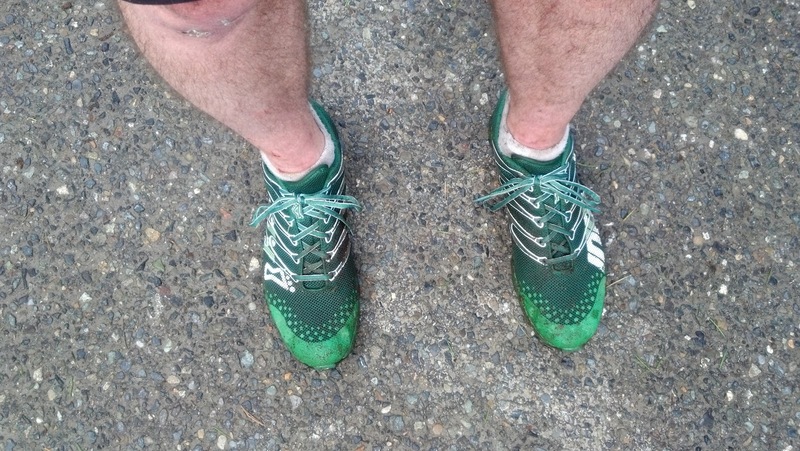 And since it was so snowy I only got to muddy them up just a bit. Based on first impressions I really like them. 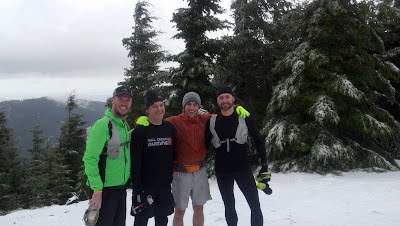 Another great day of running on the trails around Seattle - Tiger is the mountain I may be least familiar with so it's good to get some new scenery running with a new group of runners. Very commendable!I think,your strength and shoes have supported you a lot to complete the task.I have heard that Inov is one of the very best athletic shoe for cross-fitters.My wife says that Inov brings the best crossfit shoes for women too. Như chúng ta đã biết hiện nay trên thị trường nội thất có rất nhiều thương hiệu nội thất văn phòng khác nhau tạo ra những sản phẩm nhiều mẫu mã và chất liệu màu sắc cũng như giá cả. Đặc biệt là hơn là thương hiệu Hòa Phát với mẫu bàn làm việc văn phòng luôn được thu hút nhiều người sử dụng. Không những về mặt chất lượng thì sản phẩm bàn làm việc tại văn phòng cũng cần tuân thủ các quy tắc thiết yếu như về chất lượng ân toàn, gọn nhẹ, để chuyển thiết kế đơn giản không quá cầu kì thì những yêu câu ấy thì bàn văn phòng hcm của Hòa Phát Sài Gòn đấp ứng những nhu cầu ấy cho khách hàng sử dụng. Không những về bàn mà chiếc ghế dành cho văn phòng cũng là yếu tố không thể thiếu trong văn phòng làm việc và đặc biệt cần có sự kết hợp hài hòa giữa bàn làm việc cho văn phòng. Và hiện nay các mẫu ghe xoay van phong luôn được các văn phòng công ty chọn lựa mẫu ghế làm việc cho nhân viên tại văn phòng.